TUCSON – School shootings, mass shootings, all becoming too familiar these days. 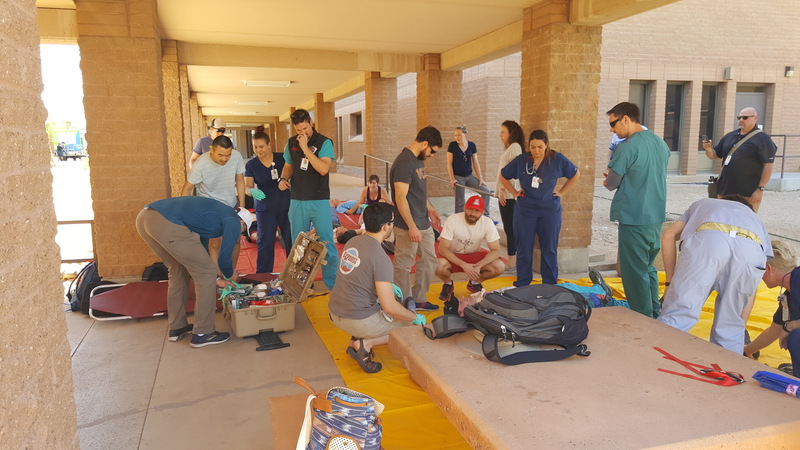 That’s why here in Tucson, resident-physicians in the Emergency Medicine department at the U of A College of Medicine took part in a mass shooting exercise. The drill was to train the Emergency Room personnel to make sure they’re prepared in case of a disaster. It took part at Banner University Medical Center South campus. As part of the simulation, the participants pretended that three gunmen fired AR-15s into a crowd of concertgoers at the nearby Kino Sports Complex. The drill was meant to be as realistic as possible, complete with fake blood. Dr. Dan Beskind, who heads Emergency Medical Services, said the procedures in the mock drill came directly from the Las Vegas shooting in October when 58 people were killed and 851 injured. Participants in the drill said it was good training. They said hope they never have to use it but if it happens they’ll be prepared and ready to save lives.